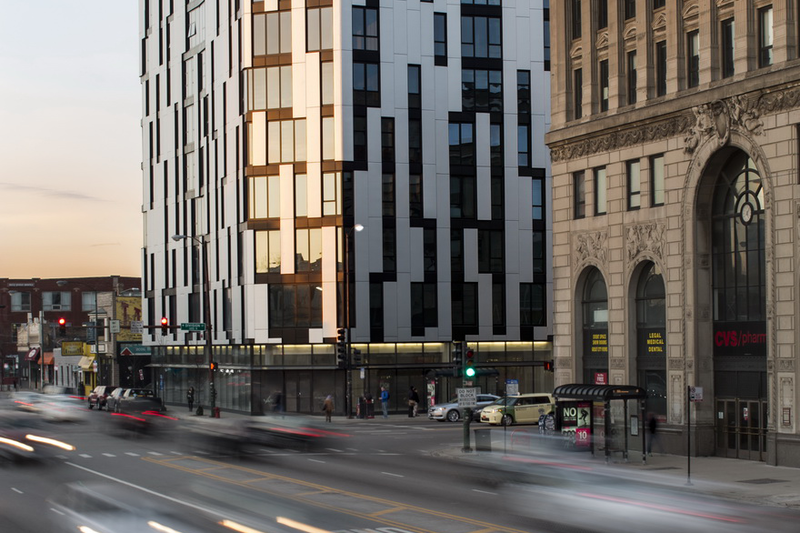 Situated 300 feet from the Blue Line train entrance and steps away from bus routes, 1611 West Division is dedicated to reducing traffic congestion and air pollution in its outreach to mass transit users, bicyclists and pedestrians. The evocative eleven-story apartment building made news this June by filling every unit soon after construction ended, even though it offered no on-site parking or even easily accessible street parking. Transit-Oriented Development, or TOD, promotes smart and sustainable growth in urban areas by utilizing land use policies, zoning regulations and design guidelines to combat traffic congestion, decrease commutes, improve air quality, and preserve green or open spaces. Seattle and Portland were early adopters of TOD principals in urban planning. Sacramento was the first US City to include TOD in its zoning code; today, most metropolitan areas with major transit infrastructure have adopted high-density TOD plans. Chicago’s “Metropolis 2020,” blueprint includes TOD as in important component of city planning. (www.metropolisplan.org). Video created by Josh Duensing of 80JD.net. Music composed by Jordan Lehning. Production assistant Lauren Beck.